Superfluid helium setup: Fully rotational cryostat, ultra-high-sensitivity CCD video camera, computer, laser, and optics. Vacuum system remained in lab (non-rotational) frame, requiring novel coupling to precisely control temperature and tracking-particle injections while rotating at 10 Hz. System controlled wirelessly. Videos of superfluid helium quantum vortex dynamics captured in real time. As a graduate student at the University of Maryland, I studied the nonlinear dynamics of complex systems. Working in Dan Lathrop's Nonlinear Dynamics Laboratory, I designed and built a fully rotational cryogenic laboratory to probe the quantized vortex lattice of superfluid helium – an exotic state of matter that develops when helium is cooled to about 2 degrees above absolute zero. Superfluid helium has no viscosity, no entropy, and forms a distinctive arrangement of atomically thin vortices when rotated. Being the width of atoms (~10 nanometers), these vortices are nominally invisible to the human eye and are quantum mechanical in nature and temperament. Yet, by injecting gaseous hydrogen (or even atmospheric) particles into the cryostat, we can create tiny ice particles (on the order of a micron) that become trapped on the cores of the vortices. Then, we can project a sheet of laser light into the cryostat and capture the light reflecting off of the frozen particles using an ultra-high-sensitivity video camera. In this way, we can witness quantum mechanical phenomena in real-time with our naked eyes! When superfluid helium is rotated, the vortices carry the momentum of the quantum fluid and, in theory, form an organized lattice of minimal energy. This lattice arrangement was hypothesized by Richard Feynman in 1955, but had never been observed in real time. By re-engineering the cryogenic setup, we not only observed and measured the dynamics of the vortex lattice, but we also tracked small perturbations of the fluid – the first direct observations of Tkachenko waves in superfluid helium since their theoretical introduction in 1966. In addition, we captured observations of differential rotation with distinct Stewartson layer boundaries, Kelvin-Helmholtz instabilities, and the formation and propagation of superfluid eddies. We also documented the presence of gravity-capillary surface waves that conclusively demonstrate an interaction between the liquid helium free surface and the bulk of the fluid. Isolation cell to minimize heat transfer and more precisely characterize the quantum vortex dynamics. Particle tracks depicting differential rotation in superfluid helium. 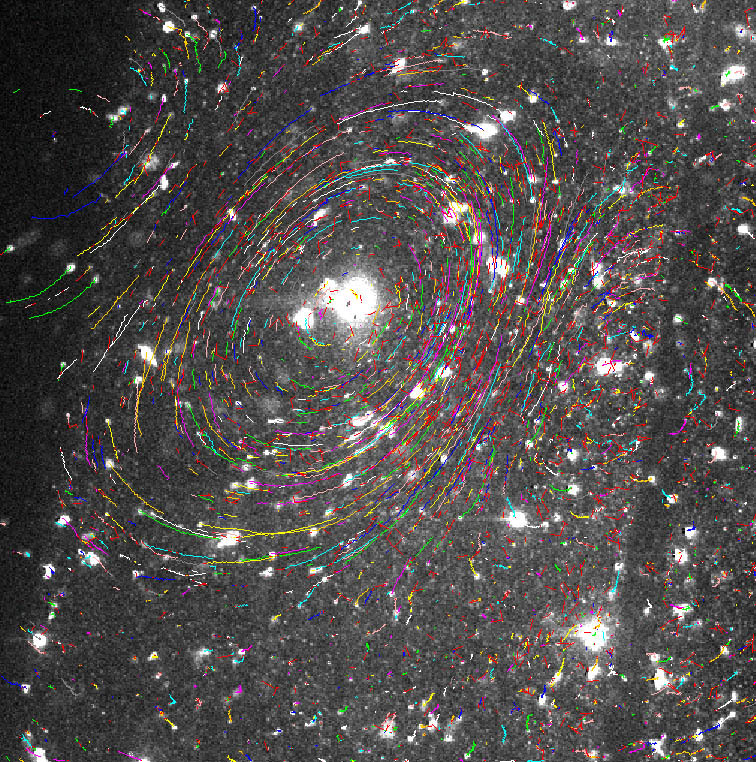 Particle tracks highlighting the dynamic formation of eddies within superfluid helium. (a) Observations of the vortex lattice array in helium-4. (b) Evidence of a well-defined lattice structure. Deviations from the triangular array are likely a consequence of internal waves and small perturbations propagating throughout the fluid. (c) At 5 rad/s (0.8 Hz), the auto-correlation of consecutive movie frames gives a measured vortex line spacing of 0.10 mm – a value in good agreement with Feynman’s prediction. Fonda E., Gaff K.T., Paoletti M.S., Sreenivasan K.R., Lathrop D.P. Enrico Fonda, Gaff K.T., Paoletti M.S., Sreenivasan K.R., Lathrop D.P.